The Nissan Figaro is a front-engine, frontwheel drive, retro-syled 2+2 car manufactured in 1991 for the Japan market. All were right-hand drive. Based on the first-generation Nissan Micra, the Figaro was manufactured at Aichi Machine Industry, a special projects group which Nissan would later call "Pike Factory," which also produced three other niche vehicles: the Be-1, Pao and S-Cargo. 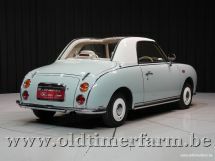 As you can note, the upper side elements of the Figaro's bodywork remain fixed, while its fabric soft top retracts in conjunction with a solid panel with a derfroster-equipped glass rear window. Standard equipment included ivory leather seats with contrasting piping, air conditioning, CD player, chrome and Bakelite-style knobs, soft-feel paint on the dashboard top, chrome-trimmed speedometer with smaller inset gauges for fuel and engine temperature; and chrome-trimmed tachometer with insert clock. The four available exterior paint colors represent the four seasons: Topaz Mist (Autumn), Emerald Green (Spring), Pale Aqua (Summer) and Lapis Grey (Winter). 8,000 Figaros were originally manufactured, with an additional 12,000 subsequently manufactured to meet demand. 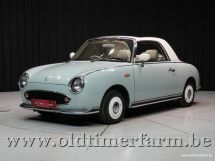 Prospective purchasers entered a lottery to purchase a Figaro.